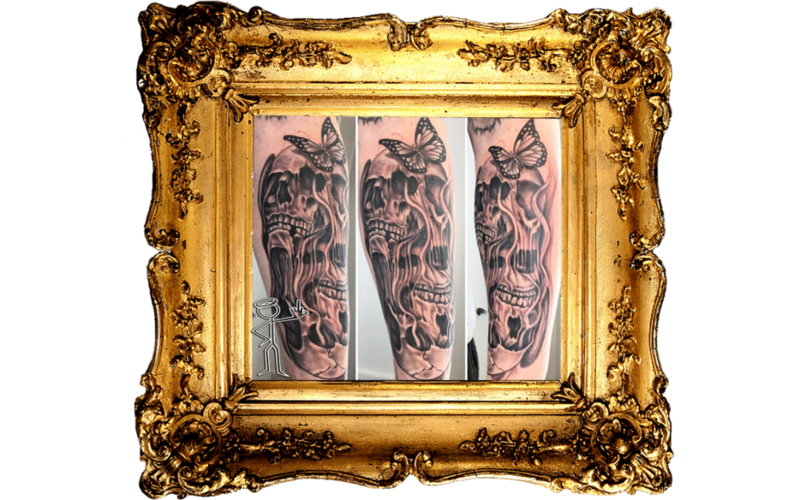 This customer had one request for a lower half sleeve : Skulls. 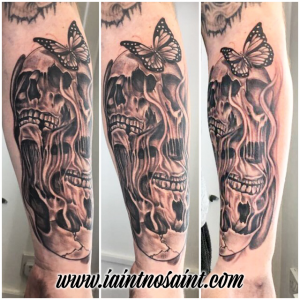 He came to the I Ain’t No Saint near Radlett Tattoo Studio to get some new work done. The plan is to create a full lower half sleeve and Iaint started with this piece on the inside forearm. The lower half sleeve will consist of different Skull Tattoos. From a reference image sent through by the customer Iaint created a piece that would work for the inside of the arm. With a small addition to the skulls of a Butterfly. Plans for the future are to continue this lower half sleeve, so keep an eye out in the new year for progress! If you would like to see more of Iaint’s work click here. Do you know someone who wants to get some new Ink? Why not treat them this Christmas with one of our Tattoo Gift Vouchers! They are available online and in the Studio. To book in come in to the Studio during our opening times to have a chat. Or you can contact us now and start the ball rolling!